If you’ve been following climate news you’ve likely heard that we need to get to net zero emissions by midcentury to avoid the worst impacts of climate change. But how was 0 by 2050 chosen as the goal, and how close are we to reaching it? Since climate science and math can get a bit complicated, this post covers the basics behind the “0x50” target and what it means for the US. Comprehending the scale of the challenge before us is the first step to addressing it. In the Paris Agreement, the international agreement on climate change, almost every country pledged to stay “well below” 2°C and to “pursue efforts to limit the temperature increase even further to 1.5°C.” We are already above 1°C of global warming. Without getting bogged down in the details, let’s all agree that for our children and grandchildren’s sake we should try to keep the planet to 1.5°C. While every bit of warming has harmful impacts, 1.5°C is certainly better than 2°C or higher. We know that emitting CO2 leads to higher concentrations of CO2 in the atmosphere, which causes global warming. Very important to note is the rate at which atmospheric CO2 concentrations are increasing compared to historical records. According to NOAA, the current rate of increase for CO2 concentrations is about 2.1 ppm per year, compared to about 0.7 ppm in the 70s. Perhaps more telling: “today’s rate of increase is more than 100 times faster than the increase that occured when the last ice age ended.”3 This is mainly due to the burning of fossil fuels since the industrial revolution. Yes, it’s our own doing. The last time levels of CO2 were as high as 300 to 400 ppm was 3 million years ago, during the mid-Pliocene. Temperature was 2°C to 3°C above pre-industrial temperatures and sea levels were 15-25 meters higher.4 The last time levels were consistently higher than 400 ppm was 16 million years ago, during the Miocene. This warming period was caused by massive and prolonged volcanic activity, over hundreds of thousands of years5 -- meaning atmospheric CO2 concentrations were increasing at a significantly slower rate than we are causing at present day, giving the earth and the plants and animals living on it more time to play catch up. The second way to think about CO2 levels is in terms of how much CO2 we can emit to stay below a temperature threshold. This is frequently referred to as our carbon budget, with the most common temperature thresholds being an increase of 1.5°C or 2°C. In all of the scenarios modeled out by the IPCC that keep our global warming below 1.5°C, it is critical that CO2 emissions are reduced to net zero by 2050. So, if we are able to rapidly reduce our global emissions to net zero by midcentury, then we can manage to stay within our carbon budget and avoid a global warming beyond 1.5°C.10 Hence, 0x50. The US must play a large role in the global effort to get to 0x50. We are the second largest emitter in the world, responsible for about 15% of global emissions with only 4.3% of the global population.11 Like other developed countries, we are responsible for a greater amount of emissions and have an easier path to deep decarbonization than developing countries. As a result, we should be acting faster than developing countries. Under President Obama, the US set the goal of reducing emissions 26-28% below 2005 levels by 2025. This would put us on track to reduce emissions by at least 80% by 2050, the minimum the US needs to do in order to keep atmospheric CO2 concentrations below 450 ppm, providing a 50% chance of keeping global average temperature from rising 2°C above pre-industrial levels by 2100. It would not put us on track to stay below 1.5°C. For a while it looked like US emissions had peaked and we were in a slow but steady decline. In 2016, the US emitted 5.794 GT CO2. In 2017, total US emissions fell by 0.66%.12 However, in 2018, after three years of decline, we had a sharp rise in emissions of 3.4%. This is taking us further in the wrong direction. We would need to reduce our emissions by 2.6% annually over the next 7 years in order to make our target for the Paris Agreement-- and even more to reach 0x50.13 With the current Administration abandoning our climate goals and rolling back crucial environmental and emissions regulations, the task becomes even more challenging. So yes, the 0x50 target is an incredibly ambitious challenge that’s going to require some serious leg work. But thanks to strong scientific analysis, we know that this is the goal that, if reached, will give us a good chance of avoiding the most destructive impacts of our changing climate. Now we have the ability (and responsibility) to use this target to guide our climate policymaking. There are many technologies and policy mechanisms that can help reduce emissions. What we must continually ask ourselves, though, is which combinations of these resources and strategies have the best chance of getting us to 0x50. McSweeney, Robert, and Rosamund Pearce. 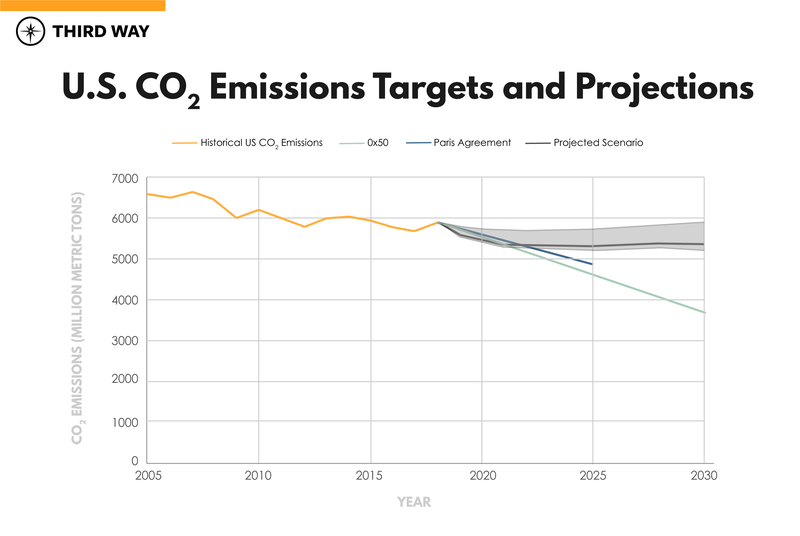 “Analysis: Just Four Years Left of the 1.5C Carbon Budget.” Carbon Brief, 8 Jan. 2019, www.carbonbrief.org/analysis-four-years-left-one-point-five-carbon-budget. Accessed Jan. 28, 2019. Jones, Nicola. “How the World Passed a Carbon Threshold and Why It Matters.” YaleEnvironment360, 26 Jan. 2017, https://e360.yale.edu/features/how-the-world-passed-a-carbon-threshold-400ppm-and-why-it-matters. Accessed Jan. 28, 2019. “Carbon Dioxide at NOAA’s Mauna Loa Observatory reaches new milestone: Tops 400 ppm.” Earth System Research Laboratory, National Oceanic and Atmospheric Administration, 10 May 2013, https://www.esrl.noaa.gov/news/2013/CO2400.html. Accessed Jan. 28, 2019. Hoffman, Jeremy S., et al. “Regional and Global Sea-Surface Temperatures during the Last Interglaciation.” Science, American Association for the Advancement of Science, 20 Jan. 2017, science.sciencemag.org/content/355/6322/276. Accessed Jan. 28, 2019. Kasbohm, Jennifer, and Blair Schoene. “Rapid Eruption of the Columbia River Flood Basalt and Correlation with the Mid-Miocene Climate Optimum.” Science, American Association for the Advancement of Science, 1 Sept. 2018, advances.sciencemag.org/content/4/9/eaat8223. Accessed Jan. 28, 2019. Rogelj, Joeri, Drew Shindell, and Kejun Jiang. “Mitigation Pathways Compatible with 1.5°C in the Context of Sustainable Development.” Intergovernmental Panel on Climate Change, 2018, https://www.ipcc.ch/site/assets/uploads/sites/2/2018/11/SR15_Chapter2_Low_Res.pdf. Accessed Jan. 28, 2019. The International Energy Agency’s New Policies Scenario (NPS) released in the World Energy Report 2017 reflects similar findings. The NPS takes into account current policies, including the Nationally Determined Contributions of the Paris Agreement, as well as likely effects of announced policies. This scenario predicts that the world will exceed the carbon budget of 1.5°C by 2022 and 2°C by 2034. Hausfather, Zeke. “Analysis: Global CO2 emissions set to rise 2% in 2017 after three-year plateau.” Carbon Brief, 13 Nov. 2017, https://www.carbonbrief.org/analysis-global-co2-emissions-set-to-rise-2-percent-in-2017-following-three-year-plateau. Accessed Jan. 28, 2019. Hausfather, Zeke. “Analysis: Fossil-fuel emissions in 2018 increasing at fastest rate for seven years.” Carbon Brief, 5 Dec. 2018, https://www.carbonbrief.org/analysis-fossil-fuel-emissions-in-2018-increasing-at-fastest-rate-for-seven-years. Accessed Jan. 28, 2019. C.1. 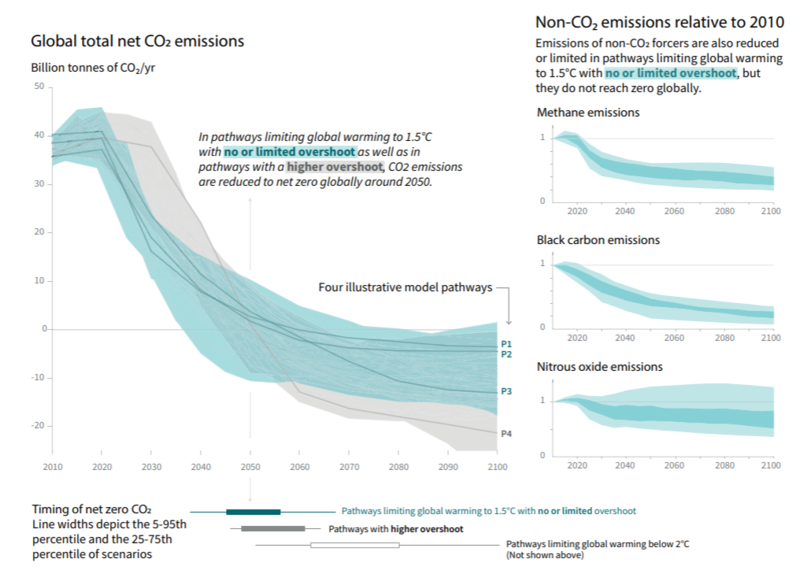 In model pathways with no or limited overshoot of 1.5°C, global net anthropogenic CO2 emissions decline by about 45% from 2010 levels by 2030 (40–60% interquartile range), reaching net zero around 2050 (2045–2055 interquartile range). “Special Report: Global Warming of 1.5 ºC, Summary for Policymakers.” Intergovernmental Panel on Climate Change, 2018, https://www.ipcc.ch/sr15/chapter/summary-for-policy-makers. Accessed Jan. 28, 2019. “U.S. and World Population Clock.” United States Census Bureau, https://www.census.gov/popclock. Accessed Jan. 28, 2019. Houser, Trevor, and Peter Marsters. “Final US Emissions Numbers for 2017.” Rhodium Group, 29 March 2018, https://rhg.com/research/final-us-emissions-numbers-for-2017. Accessed Jan. 28, 2019. “Preliminary US Emissions Estimates for 2018.” Rhodium Group, 8 Jan. 2019, https://rhg.com/research/preliminary-us-emissions-estimates-for-2018. Accessed Jan 28, 2019.